Merry Christmas! I hope you are having a wonderful day. We've been busy with many family activities and parties with friends, and I wanted to share with you what I thought would be a Pinterest fail.....but actually turned out okay. Set aside 1/3 cup of the Creamy White Frosting. Frost tops of cupcakes with the remaining frosting. For houses, cut 2-inch pieces from chocolate-covered peanut butter wafer sandwiches. At top of each piece make an angled cut on each side to create a place to attach roof. For each roof, cut two 3/4-inch pieces of granola bar; gently press onto angle cuts on a wafer sandwich piece. If necessary, attach with frosting. Frost roof as desired. Cut a small 1/2 " X 1/8" piece from chocolate wafer cookie for chimney and attach to roof. It works best if you cut it at an angle on the bottom where it meets the roof. Add shredded wheat for doors and dragees for doorknobs, using frosting to attach. 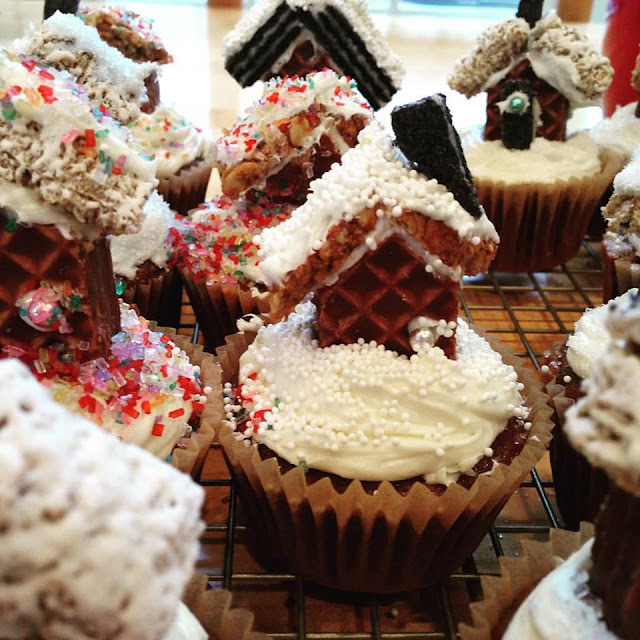 Carefully place houses on cupcakes. Decorate with fresh herb sprigs as desired, using rosemary sprigs for evergreen trees and thyme sprigs for garlands. 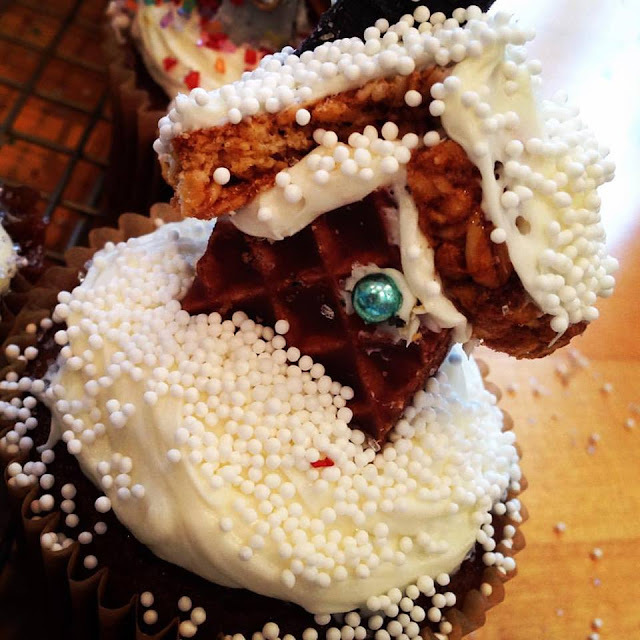 If desired, sprinkle tops of cupcakes with edible glitter for snow. Makes 24 (2-1/2-inch) cupcakes. Preheat oven to 350 degrees F. Line twenty-four 2 1/2-inch muffin cups with paper bake cups; set aside. Prepare cake mix according to package directions, except omit one of the eggs. Add cake spice and ginger to the cake mix. Add molasses and vinegar with the eggs. Fill muffin cups; bake according to package directions for cupcakes. Cool cupcakes in muffin cups on wire racks for 5 minutes. Remove cupcakes from muffin cups. Cool completely on wire racks. NOTE: I replace vegetable oil with grapeseed oil when a cake mix calls for vegetable oil. These cupcakes are truly the most delicious and moist cupcakes I've ever had. I hope you try them! 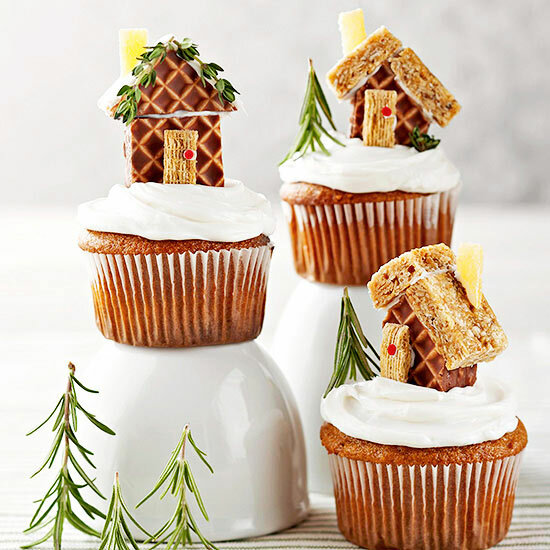 Merry Christmas, My Sweet Bloggy Friends! Today's tradition is in honor of Mr. Art @ Home who hails from New Orleans. In Louisiana, residents build bonfires on the levees of the Mississippi River so Père Nöel can find his way to good boys' and girls' houses. Today's tradition comed from Peru. Hot chocolate joins panetón, lechón and turkey in Peru’s canon of Christmas foods. However, this is a bit strange, as Christmas falls in early summer in Lima. As María Pía Barrientos writes in El Comercio, “Hot chocolate is a marvelous, thick and warming beverage capable of heating you up if you’re about to step out into one of the earth’s poles. No one questions its exquisite flavor. But does it really make sense to drink it when the sun finally comes out and we begin to suffocate in the heat?” Surprisingly, hot chocolate is not a popular drink during winter in Peru! 10 For if, while we were God’s enemies, we were reconciled to him through the death of his Son, how much more, having been reconciled, shall we be saved through his life! 11 Not only is this so, but we also boast in God through our Lord Jesus Christ, through whom we have now received reconciliation. Whisk milk, cream, and hot chocolate mix together in a small saucepan. Heat on medium-low heat until it begins to bubble. Add syrup and whisk well. Pour into mug and add whipped cream if desired. In Bolivia workers get double or three times the normal salary in December! This is called 'El Aguinaldo' and is a government law and has to be paid for by the employers. Many workplaces also give a 'Canastón de fin de Año' or 'End of the year basket' to their employees. It's a large basket or container full of things like grocery items, a bottle of cidra (non alcoholic sparkling cider) and a panetón (sweet fruit bread). I would love to try this fun and *sweet* Welsh tradition: Taffy-making. This is how families whiled away the dark hours of Christmas Eve's night, leading up to the Plygain service. Toffee was boiled in pans on open fires and - this is a nice twist - dollops were dropped into icy cold water. The taffy curled into all sorts of shapes - like letters. This was a way of divining the initials of the younger, unmarried family members' future loves. In the dark hours on the morning of Christmas Day, before the cockerel crowed, men gathered in rural churches to sing. They sang mainly unaccompanied, three or four part harmony carols in a service that went on for three hours or so. That's Plygain. This is a tradition which still thrives in parts of mid Wales. He is the image of the invisible God, the first born of all creation. For. . . all things have been created by Him and for Him. And He is before all things, and in Him all things hold together. He is also head of the body, the church; and He is the beginning, the first born from the dead; so that He Himself might come to have first place in everything. For it was the Father's good pleasure for all the fullness to dwell in Him, and through Him to reconcile all things to Himself, having made peace through the blood of His cross. In Iceland, books are exchanged on Christmas Eve, and you spend the rest of the night reading. People generally take their books to bed along with some chocolate. How cozy and wonderful does that sound? I think I love this one! This is the *perfect* tradition for Literary Friday, and I want to adopt it! Plus I happen to have the perfect recipe for hot chocolate. Just click on the featured post at the top of the sidebar! 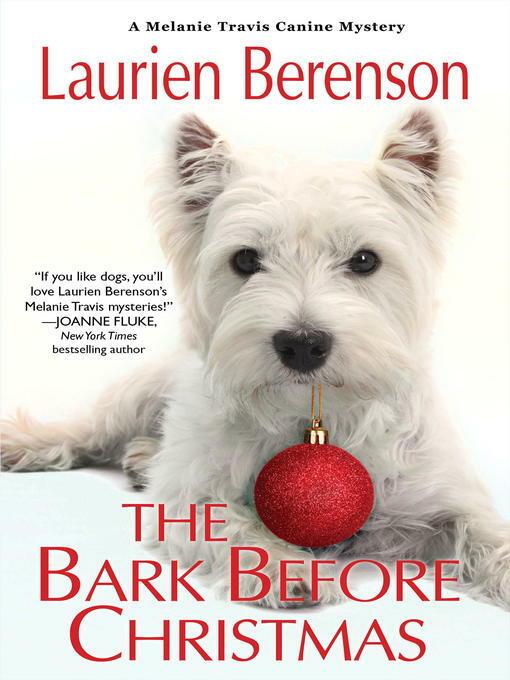 This week I read The Bark Before Christmas, a Melanie Travis mystery, by Laurien Berenson, and The Christmas Promise by Donna VanLiere. There’s nothing lovelier than Christmas in Connecticut, but Melanie can scarcely find a moment to enjoy the festivities. With her youngest son approaching toddlerhood, she’s decided to return to her old job at Howard Academy, a posh private school attended by the children of Greenwich’s well-heeled gentry. Balancing work, motherhood, and the hectic dog show circuit takes some fancy footwork, especially when the headmaster taps her to be the chairman of the school’s Christmas Bazaar. The prize show dog that goes missing just happens to be a Westie named Kiltie. Y'all know how much I love that breed, and Kiltie's owner, Sharon, is a horrible person. She keeps her Westies far away from the house in a kennel. Westies need their people! I hated that part of the book, and I seriously considered giving the book one star because of it! But this is truly a cozy Christmas mystery although the main character Melanie lives an exhausting life which is made even more complicated when she's held responsible for Kiltie's disappearance. I did enjoy many of the characters, and Melanie's aunt who's a guru in the Standard Poodle show world, is so much fun! I really did love her, and I'd read more books in this series just for this one character. Have you read any of the Melanie Travis mysteries? I'd love to hear from you! This is a story about how a promise from one person to another shows us the true meaning of faith, remembrance, and love. Seven years ago Gloria endured a family tragedy that almost shook her faith entirely. Each Christmas she places a card in an envelope on her tree, restating a promise she made to her husband before he died. Now, having moved from her small town and all the painful memories it held, she is building a life by caring for people in need. Whether it's a young mother who can't pay her electric bill or a family who needs some extra food, Gloria always finds a way. Miriam is a thorn in Gloria's side. Miriam is a constantly critical, disapproving neighbor who looks with suspicion at all the good things Gloria does. When a twist of fate makes them roommates instead of neighbors, it's the ultimate test of patience and faith. Chaz has a good job as head of security at Wilson's Department Store, but each night he returns home to an empty apartment. He longs for a wife and family of his own but realizes that the life choices he's made have alienated him. He befriends a young boy whose mother has fallen on hard times, giving him a chance to have a life he thought impossible.In The Christmas Promise, the lives of these characters collide and we learn that even as we move ahead, the past is never far behind. And when we are forgiven much, we love much. This is one of the best Christmas books I've ever read. Gloria is a mother after my own heart: She never gives up on her son, and she doesn't succumb to grief and despair. Instead she tirelessly helps others in dire need. 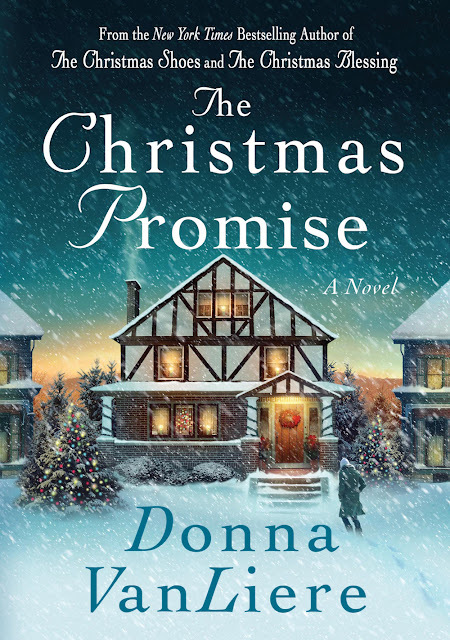 Everything she does is in response to a Christmas promise she made many years ago. Chaz's story was so touching. He is one of the most developed characters I've ever read which is amazing considering it's a fairly short novel. I would love to read another book about him! Scripture says that a little child shall lead them, and the love of Donovan, the child of a co-worker, led Chaz out of a very dark place. I am impressed how VanLiere weaves several story lines together to merge into one Christmas miracle. Christmas is a time for hope, redemption, and new beginnings. The Christmas Promise reminds us how prayer can not only change our circumstances, but can change us, too. I will probably read this book again. It's definitely one for the keeper shelf, and it is my newest Christmas tradition. In the Czech Republic, unmarried women stand in front of doors facing away from them. They throw a shoe over their shoulder, and if it lands with the toe pointing towards the door, then they will be married within the year! 31 “The days are coming,” declares the Lord, “when I will make a new covenantwith the people of Israel and with the people of Judah." Today's tradition comes from Ireland. January 6, the Feast of the Epiphany, is traditionally when the Irish finish celebrating Christmas. It is also known as Nollaigh na mBean in Irish (Women’s Christmas). Tradition has it that women get the day off and the men of the house get to do the housework, cooking and take down the Christmas decorations. Women meet up, have a day out and treat themselves. Methinks I like this tradition, and I do have some Irish blood. Are you reading this, Mr. Art @ Home? I was standing in the kitchen facing out family room when I took this photo. I received an early Christmas present: Hot Chocolate Pot from MacKenzie-Childs. The sugar caster holds vanilla sugar. My sorority sister Fran gave me some delicious goodies for the Hot Chocolate Bar. She also made me an ADORABLE scarf in Zeta turquoise! We have hot chocolate spoons, a selection of sprinkles, peppermint, variety of marshmallows, and sugars for our cocoa concoctions. I added the tray in case of spillage. I don't want to ruin our cute red and white ticking runner! I decorated the bookcase, too. Hot Chocolate Bars must needs cookies! and she brought me tea!!! Our sweet neighbors Chris and Nicole came over last night and brought us these delicious cookies. I love the box, too! Some of my long-time followers know how much I love K-dramas, so *of course* I must feature South Korea on this year's Advent Calendar! There are more Christians in Korea than any other Asian country (30% are Christian). Koreans enjoy celebrating Christmas, and even non-Christians attend church during the Christmas season! Sometimes Korean Santas wear blue rather than red. They also enjoy ordering Baskin Robbins Christmas ice cream cakes for their Christmas celebrations. 12 "For I will be merciful to their unrighteousness, and their sins and their lawless deeds I will remember no more." Today's tradition is from Australia. It's the beginning of summer during the Christmas season, and children are out of school from mid-December until mid-February. On boxing day, Aussies enjoy visiting friends and having barbeques on the beach. 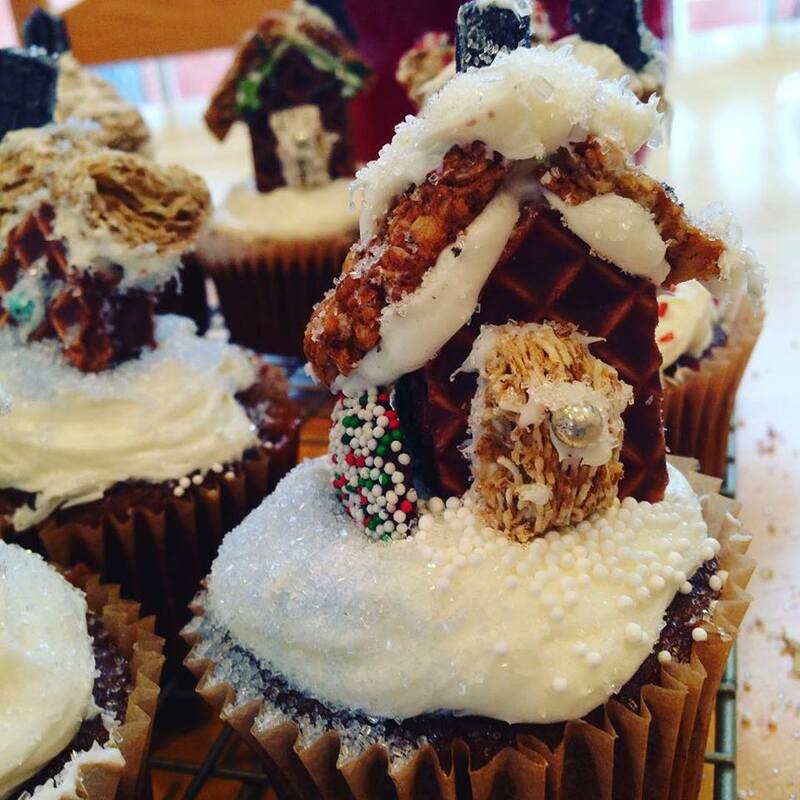 What a fun way to celebrate the season! Although Germany is usually credited for giving the world the Christmas tree, the first Christmas tree was actually displayed in Riga, Latvia in 1510. I love Christmas trees, and if you follow my Instagram feed you'll notice my love for them! The first half of my calendar is filled! 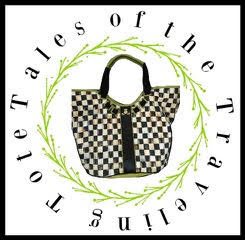 Today's featured tradition is from China. Only about one percent of Chinese people are Christian, and it's ironic because so many Christmas trees and decorations are manufactured in China, and the folks making them have no idea for what purpose they serve! A tradition that's becoming popular on Christmas Eve is giving apples. Many stores have apples wrapped up in colored paper for sale. People give apples on Christmas Eve because in Chinese Christmas Eve is called 'Ping An Ye' (which means quiet or silent night) and the word for apple in Chinese is 'Ping Guo' which sounds similar. 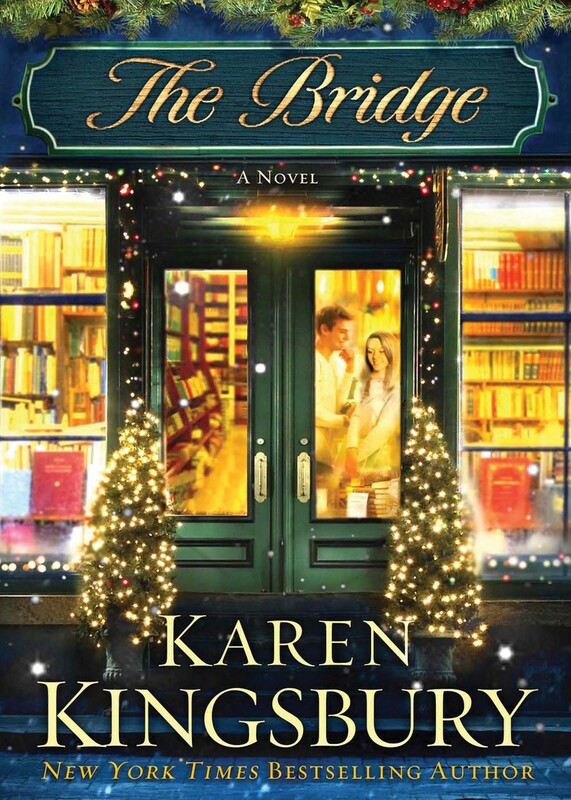 This week I read The Bridge by Karen Kingsbury. It is a Christian novel with a Christmas theme. It is our book selection for our book club this month, and The Hallmark Channel has made it into a movie. I want to preface my review with the fact that I rarely read Christian fiction. I do read quite a bit of Christian nonfiction on a daily basis through Bible studies and devotionals, and I tend to be hyper-critical of Christian fiction. I like The Bridge, both the novel and the bookstore. I would love to have an Indie bookstore close to our home like this fictitious one located in downtown Franklin, Tennessee. I love Franklin. We lived in nearby Brentwood when we were newly married, and I went to graduate school at Belmont, so I enjoyed reading about Molly and Ryan's time at Belmont. 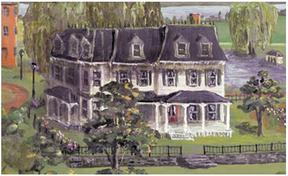 The flood in 2010 was devastating and so sad, but Franklin has bounced back. One of the few problems I have with the book is the lack of responsibility shown by Charlie and Donna. They had little savings, and even less insurance. I also believe that if The Bridge was as special as it was depicted in the novel, then sales shouldn't have been that low. In spite of the amazing deals and free shipping offered by Amazon Prime and the convenience of eReaders, people still like to buy local, and there will always be those of us who need the feel of a book in our hands (not to mention the smell of ink). For these reasons, I have a harder time sympathizing with and relating to Charlie and Donna's plight. I love Molly and Ryan's story. They share a love for music and nineteenth century British literature, especially Jane Eyre. Both quote the novel often which I find ironic because Jane is outspoken and speaks her mind. Molly and Ryan are silent and do not speak up when they should, and this causes them both heartache. Told from multiple points of view (Molly, Ryan, Donna, and Charlie), Kingsbury gives us insight into what motivates these characters into making (sometimes) drastic decisions. I was especially intrigued by Charlie's point of view. Overall, this book's story is excellent and its Christmas message is sweet. I also think it's a great read for anyone who appreciates special Indie bookstores, too. 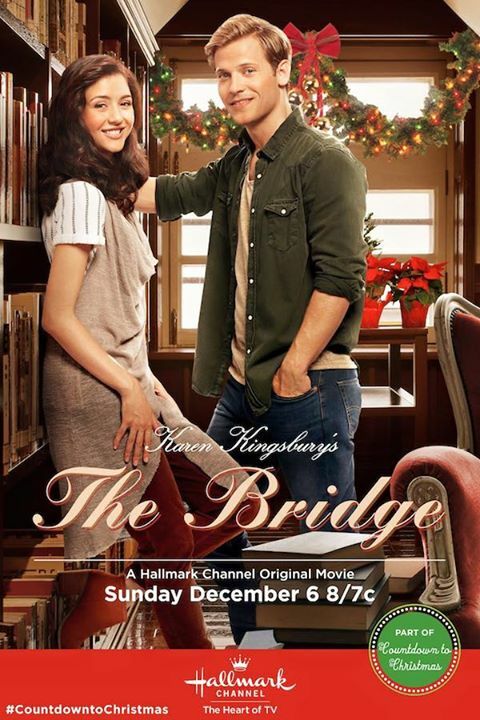 I must say that I am VERY DISAPPOINTED with The Hallmark Channel. I couldn't wait to watch The Bridge, but it was only Part 1 will be aired this season. We have to wait until Christmas 2016 for Part 2. STUPID HALLMARK CHANNEL YOU ARE NOT MY FRIEND! What have you been reading lately? I will not have a link party this week because I will be out of town at a horse show. The link will be up next week, so I hope you'll link-up then!